It is possible, but not trivial. It’s best to use a dedicated sdcard for MODEP. is there a MODEP image available which has all (or a good subset) or working modules available? I know could build these, thanks to @Enkerli and others detailed instructions, but honestly, I’m unlikely to do this… as my ‘dev’ time is spent on other projects at the moment… but if I can just ‘burn’ MODEP on a spare sdcard, then could be cool for a bit of FX. also stupid question, what controller support does MODEP have? midi learn/mapping? does MODEP support ‘custom UI panels’ i.e. could i create a large UI for patch, suitable for a touch screen? basically, I’m wondering, if i had an image, how much extra time i’ll need to allocation to make it useable headless. There will be in up to two weeks, I have all of them building fine for Raspberry Pi, right now I am testing whether all of them work, have the proper GUIs, etc… A lot to go through But the release is in sight. 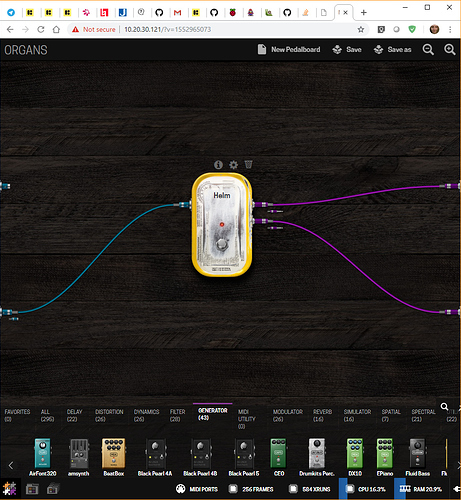 I haven’t seen custom UIs used for the pedal plugins, mostly knobs. They are mappable to MIDI in the settings page. then you can use this ‘headless’ ? by selecting a board using the pisound button. can you also select via midi program control? if not, i guess, i can have an app which listens for PC midi messages, and restarts modep with the ‘correct’ pedal boards - i guess this is what the button is doing? This is what the button does: https://github.com/BlokasLabs/modep-btn-scripts - just making an appropriate web api request for mod-ui. Hi Giedrius! Great news if you will release a new version of MODEP with even more pedals and FX! Can’t wait for that!!! As you know, it’s not about being lazy. It’s closer to priorities or “choosing your battles”. In my case, it also has a lot to do with knowledge and “bandwidth”. As a non-coder, there are days when it feels great to be learning a bit of programming, solving issues with dependencies, or testing that a certain piece of code works. If “my mind is on it”, it can be relatively effective though not very efficient. Other times, the very thought of dealing with error messages is quite offputting. Would rather be musicking. In those situations, it really feels like paying a bit for a premade solution makes more sense than spending the time checking error messages. So, buying for an image or SD card with a precompiled version of MODEP with all sorts of LV2s built-in would be a perfectly reasonable thing for me to do. Sounds like this what Blokas has done! Thanks so much! Will install it asap! Hi, Enkerli. I’m trying to find a way to load impulse responses into mod-ui. I’m trying to follow your process but I have failed so far. Klangfalter seems to be working as your information, are you able to load IR files on it? It would be great to know if that’s possible. Didn’t try that, no. Just made sure these plugins would load but only played with a few. Might not be very easy to access the filesystem from the browser interface. It might be easier to do it from the command line. Could be a good case for an app. Or to load the files as part of presets and then switch between them? Thanks for answering. That’s what I figured out so far and the main reason of asking of your experience. I guessed that even if it worked it wouldn’t access the filesystem. It’s a shame, I would really like to find a way to convert my pisound in an impulse response loader. I can do it launching Ardour, but the process is kind of clunky. I agree it would be a great case for an app, however. Load files as part of presets seems to be the way other people have approached it but I would really love to see a configurable impulse response loader (have started taking a look at code, but I’m not much of a coder). Will post if I came up with something. Not much of a coder either but file I/O needs not be very difficult. It’s mostly a question of permissions and Raspbian has access to all the niceties of Unix access control. 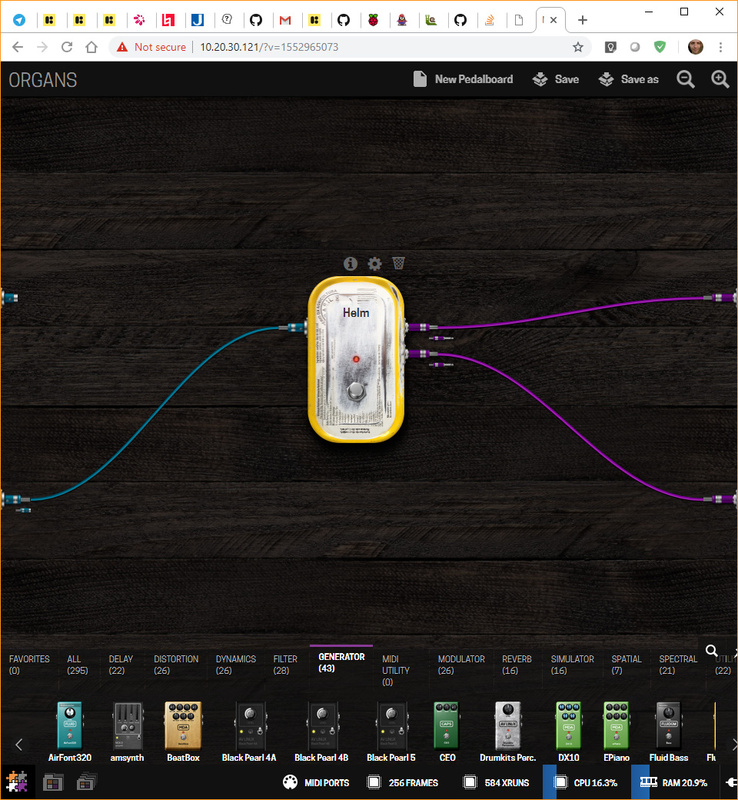 Never played with IR but a similar idea can help with wavetables and samples. There’s a lot of great information in this thread, thanks! I’m a beginner with Linux and the Raspberry Pi, but I’ve been blundering through these instructions and was able to get the QMidiArp plugins working using Enkerli’s method. Initially I could see them but not add them, used Giedrius’ journal method to debug, and found it wanted a bunch of related “.so” files. I ended up using “sudo apt-get install qmidiarp” to generate those, tracked them down, and copied them into the relevant folders…success. I thought I’d then try installing the Yoshimi LV2 synth plugin, but I’ve got stuck with that one. I installed this list of dependencies, then used “sudo apt-get install yoshimi” and copied the LV2 folder. I could now see an entry for Yoshimi in MODEP and add it, but there were no controls or parameters available. I then tried copying the above steps for QMidiArp. However, at the line “git checkout lv2extui”, instead of the message “Switched to a new branch” that you get with QMidiArp, it just says: “…did not match any files known to Git”. There is mention of lv2extui in the Yoshimi LV2 plugin source here, but I don’t really know what this is or what to do with it. Any thoughts…? Not all LV2 plugins have a GUI that is compatible with MOD, in that case a default UI is shown and the controls should be available in the settings menu of the plugin. …thanks Giedrius…in this case, there’s nothing available in the settings menu either. I’m trying to make the MPB on my ubuntu. There are some optimizations to do for a raspberry pi 3b on plugin-dep folder for the cortex a53. Unfortunately the buildroot 2016.02 doesn’t work with the a53. How do you configured your environment to match a raspberry instead of a MOD? Nevermind, I have it working now! Step 4 resulted in successfully compiled helm.lv2 folder which I just copied to /usr/local/modep/.lv2 and that’s it!